This year’s Serpentine Pavilion in London’s Hyde Park is a jumbo, 3D grid that grows organically from the ground. Articulated by slender, white, steel bars, this assemblage of small cubes - a cross between a garden folly and a mathematical model - is the product of the Tokyo architect Sou Fujimoto. In this short film, we take a look at the making of the pavilion, and follow its journey from concept to reality. 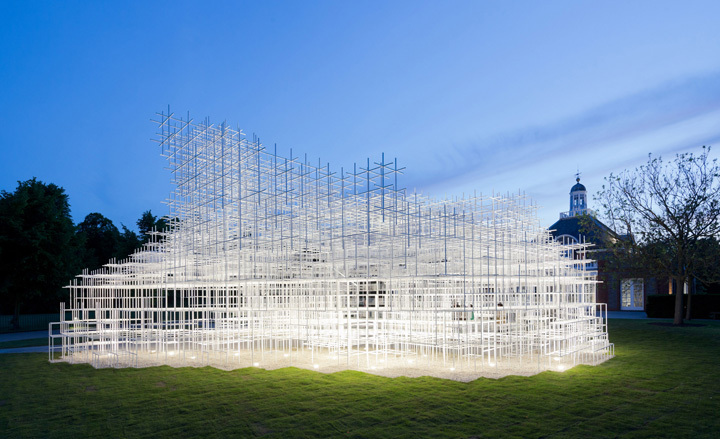 ’The experience is more like a labyrinth but the space is very simple,’ says Fujimoto. Sized more like furniture than architecture, the main frame consists of 80 cm cubes, many subdivided into 40 cm cubes that double as stairs and stepped seating. While railings outside minimize missteps and roof climbing, guiderails inside prevent bumped heads. The decision to build with a white grid stemmed from Fujimoto’s initial goal of creating an ’architectural landscape’. To forge a strong connection between his building and its surroundings, he needed to create a translucent volume. A small scale, 3D grid - Fujimoto has been grappling with grids since the start of his career - fit the bill perfectly. To sculpt the pavilion’s form plus place clear polycarbonate inserts, vertical panels for windbreaks and horizontal, disks for rain protection, Fujimoto used a 1:10 study model. ’[The design] is so complicated that we had to make a big model to understand it exactly,’ explains the architect. Prefabricated at creative manufacturers Stage One’s facilities in York, Fujimoto’s design was then trucked to London in preassembled units that were bolted together on site by the engineers at Aecom, under the direction of David Glover, who has worked a succession of Serpentine Pavilions, though formerly with Arup. At the end of its tenure, the pavilion can be taken apart and carted off to a new home.